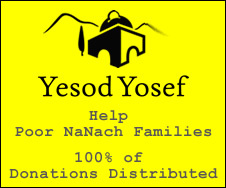 B"H this past week I opened up the Nanach store in Tsfas in Kikar Muginim and we were very successful. B"H the store will stay opened until my trip to R"H.
Right now I'm looking into a boat ride from Chaifa to Odessa, which might only cost about $200, if anyone knows anything about this or can find out please let us know. Grosser Hatslacha with the Nanach store. Shana tova!